Our Graft Delivery System (GDS®) is designed to allow for universal, quick, and accurate bone graft delivery to a surgical site without the problems of a traditional funnel.Its patented, controlled delivery method is designed to safely dispense bone graft with enough pressure to easily fill any bone void during bone graft surgery. 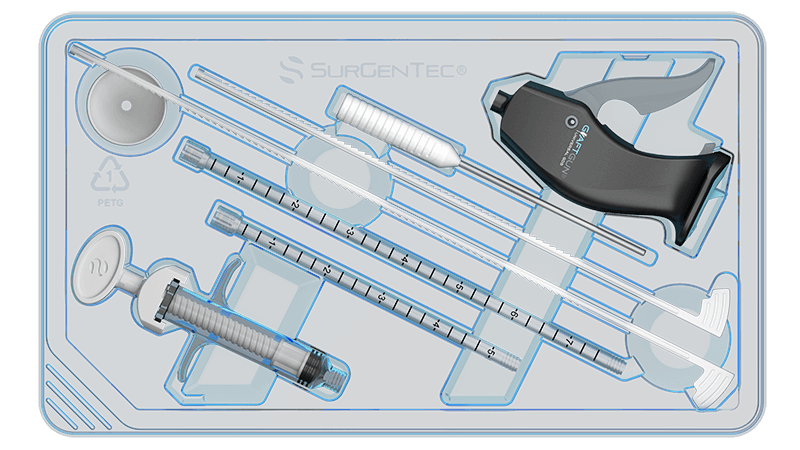 The Graftgun GDS includes SurGenTec’s loading device technology which provides surgeons the freedom to choose the bone graft that best suits their needs. Our medical device technology can offer surgeons the best options for bone graft delivery during surgery. By using our patented GraftGun®, bone graft delivery can become less invasive and more accurate. Our Bone Graft Delivery systems were developed with surgeon and patient in mind. For more information, contact SurGenTec today. Tactile feel for surgeon of orthobiologic filling void space – important because the surgeon needs to be able to judge when the void space has been adequately filled to insure the orthobiologic is contacting the adjacent vertebral body endplates. Insufficient quantity of bone graft can predispose to nonunion. 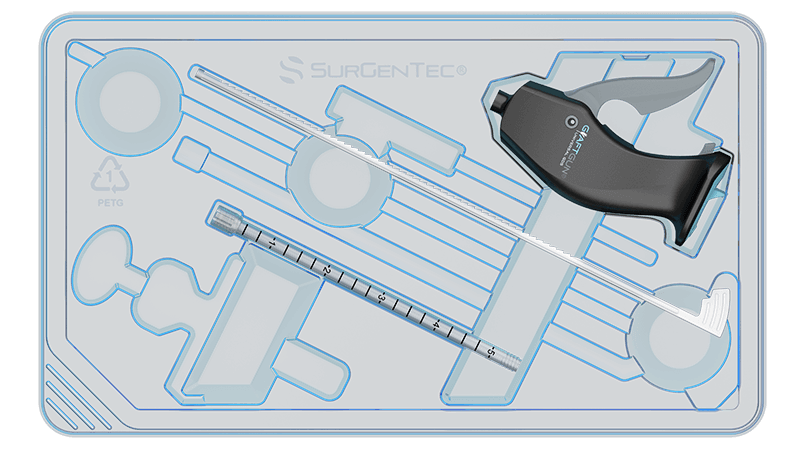 Single-handed use – offers the surgeon ease of operation, stability and balance allowing use of other instruments simultaneously.  Every squeeze of the GraftGun®’s trigger delivers approximately .25cc of orthobiologic. This allows the surgeon the confidence regarding the exact amount of orthobiologic inserted into the targeted area. Offers reproducible delivery of an orthobiologic in a controlled manner when using a delivery system. Offers ability to post-fill interbody cages, especially expandable cages that are difficult to fill prior to insertion. A study* found in the Spine Journal entitled, “Endplate Pressure Distribution is Influenced by Bone Graft Substitute within Interbody Cages”, shows where ‘graft material does influence the endplate loading profile’. So, if an interbody cage is not packed sufficiently, then the interbody cage could be more likely to fail through subsidence/endplate failure due to the different loading characteristics.